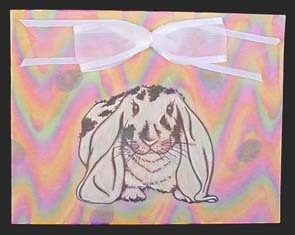 Stamp bunny on vellum with permanent ink. Let dry completely. Turn over and rub stylus tool in between lines. This will create a puffy appearance. (Do this on a magazine so there is some give to the paper). Attach vellum to background paper. Attach bow. Note: For background, we used Dee Gruenigs Caribbean Inkabilities, squeezed onto a foam sponge. We stamped Jelly Beans over background using a dark ink.